In the 1570s Tintoretto considerably expanded his artistic activity by increasing the number of commissions executed by his studio. During this period he continued to work on the Scuola Grande di San Rocco and also took part in the new decoration of the interiors of the Doge’s Palace, previously destroyed by fire. In addition, following the death of Titian in 1576, he undertook commissions for European courts while continuing with his normal Venetian work such as portraits of local senators and magistrates. The present oil, previously in an Italian private collection, was acquired in 1968. It is rarely mentioned in the literature, and the first reference was made by Heinemann in the 1969 catalogue of the Collection. Since then the canvas has been included in publications on the Thyssen-Bornemisza collection. It was published by Paola Rossi in her work on Tintoretto’s portraits. She considered it to be autograph and rejected the idea that it was by Marietta, the artist’s daughter. Rossi also suggested a date of around 1570, differing slightly from Heinemann’s suggestion of around 1575. The latter related the canvas stylistically to another work by the artist in the Gallerie dell’Accademia in Venice, while Rossi associated it with one in the Musée des Beaux-Arts de Lille. Tintoretto’s portraits are irregular in quality, in part due to the participation of his workshop. His models generally lack the gravity and sense of presence with which Titian endowed his subjects and on occasions the artist repeated poses and gestures. The present canvas, however, cannot be described in these terms. Tintoretto depicted this anonymous senator in three-quarter length, standing against a dark background (which may have further darkened with age and due to the natural ageing of the materials). The atmosphere is created by the rich colour of the heavy curtains that frame the figure from behind. 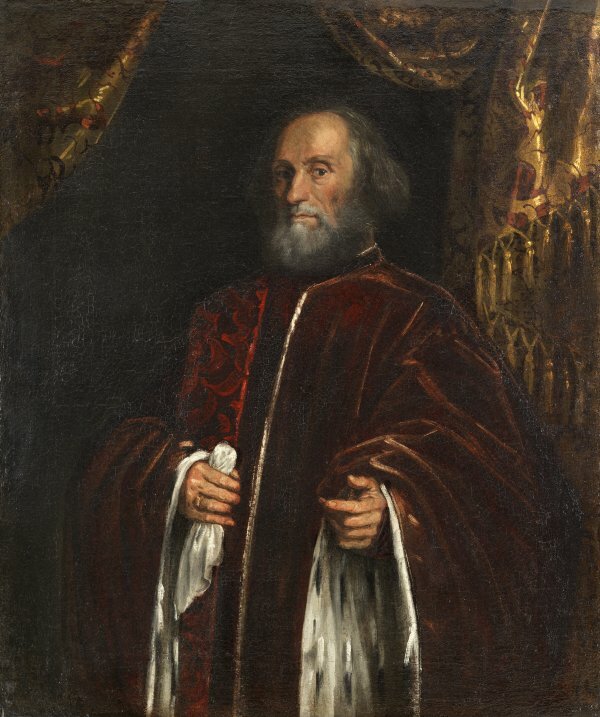 The sitter wears the official dress of the Venetian senator: a wine red, velvet toga lined with ermine (as can be seen here inside the wide sleeves), with a narrow stole that falls over the right shoulder. Tintoretto used a wide variety of solutions in his portraits for the placement of the hands: in this case the sitter holds a white handkerchief in one while the other makes a ceremonious gesture. The light is focused on the left half of the face, leaving the other half in shadow, a device that gives the sitter greater presence. The handling is broad and rapid and the manner of resolving the different textiles is clearly evident. The brushstroke is characteristic of the artist’s late period and creates lines and highlights with dazzling brilliance using a palette of scarlet and crimson tones.